Just Jew It is a Jewish magazine made exclusively for the iPad. 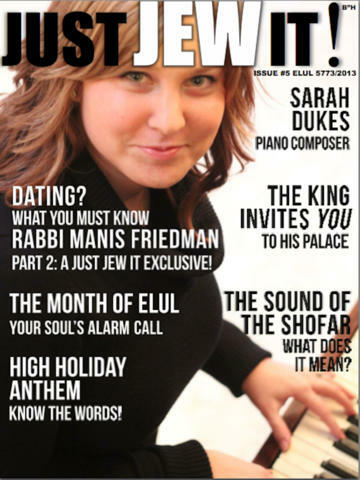 They just released their Elul addition which is now live on the Newsstand in iTunes. Volume 5 features composer Sarah Dukes who recently released a very well received instrumental album with Yaron Gershovsky “Finding Forever” is featured on the cover. Grab the new issue to read the article, it’s available by going here in the iTunes store. For more on Finding Forever click here for the JMR Spotlight.Check out Sarah on facebook here.